NASA’s Operation IceBridge on Wednesday, November 7, flew over an iceberg that is three times the size of Manhattan – the first time anyone has laid eyes on the giant iceberg, dubbed B-46 by the U.S. National Ice Center, that broke off from Pine Island Glacier in late October. 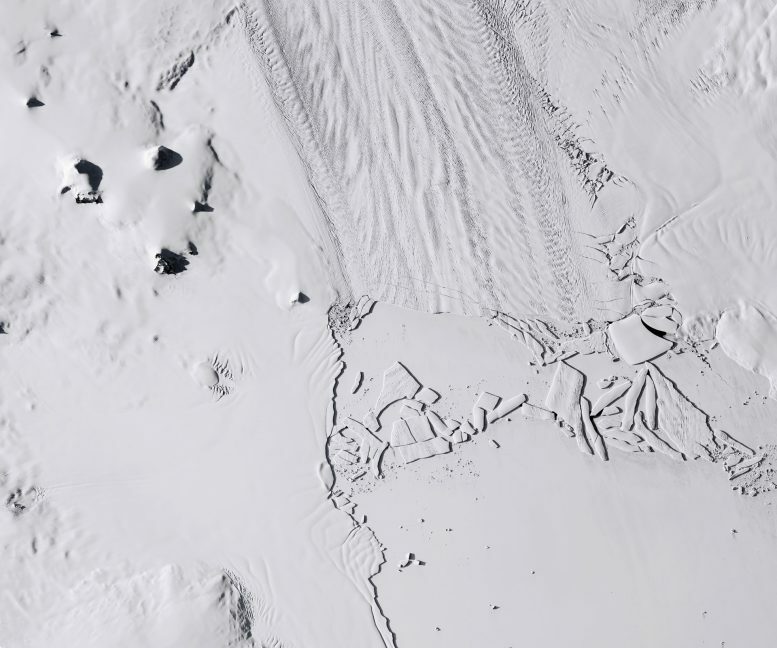 Pine Island Glacier in West Antarctica is known for dispensing icebergs into the Amundsen Sea, but the frequency of such events appears to be on the rise. The Operational Land Imager (OLI) on Landsat 8 acquired this image of the new iceberg on November 7, 2018. For comparison, the second OLI image shows the same area on September 17, 2018, before a rift quickly propagated across the glacier and spawned the bergs. Wednesday’s flight plan took the IceBridge team over Pine Island Glacier as part of the long-running campaign to collect year-over-year measurements of sea ice, glaciers, and critical regions of Earth’s ice sheets. As NASA’s DC-8 flew its pre-determined flight pattern, the new iceberg that calved in late October also came into view. 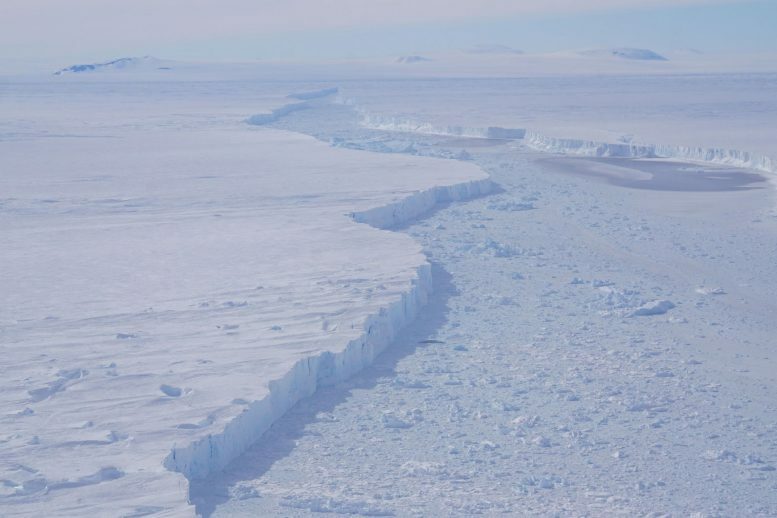 Ice shelves, floating glacial ice areas that surround much of Antarctica, calve icebergs as part of the natural process of ice flowing out to sea. But scientists are also watching closely to see if the frequency of calving events is changing over time. In late 2016, IceBridge saw a crack beginning across the ~ approximately 22 mile-wide trunk of Pine Island Glacier. It took a year for the rift to fully form and the iceberg named B-44 to break away in September 2017. 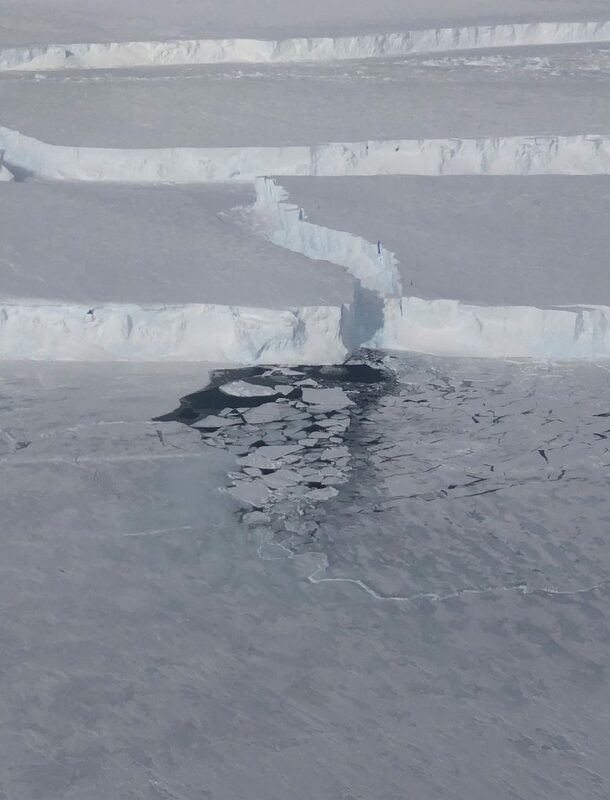 The crack that would become B-46 was first noticed in late September 2018 and the iceberg broke away about a month later. Pine Island has now calved major icebergs in 2013, 2015, 2017, and 2018. Prior to that stretch, the glacier was experiencing major calving events about every six years. 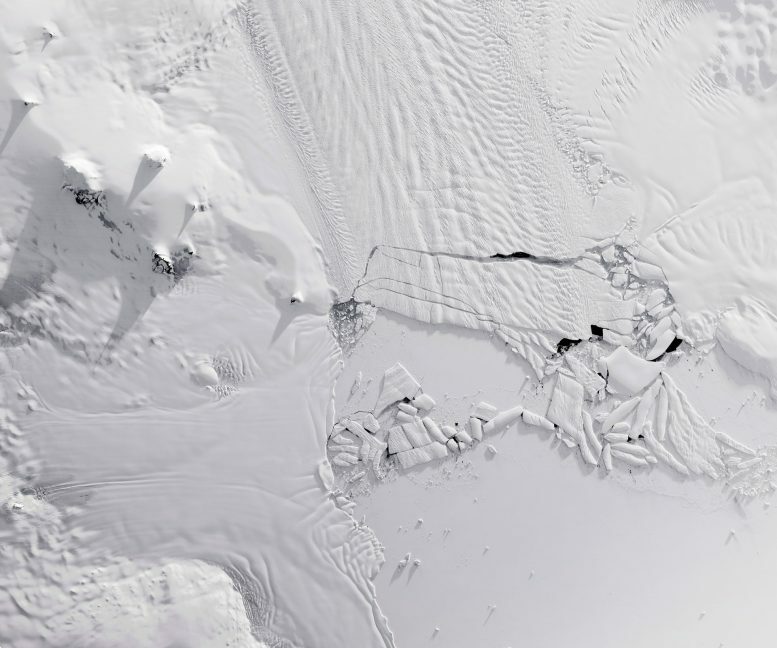 1 Comment on "NASA IceBridge Flight Spots Massive Antarctic Iceberg B-46"
It appears to me that you have the OLI images reversed – before and after.